Pixar has an impeccable track record of success with its films. Yes, there have been some speed-bumps with Cars 2, Brave and Good Dinosaur (so I've heard) but overall you can usually expect quality film-making from The Lamp. Coco is the 19th Pixar film and is directed by Lee Unkrich (Toy Story 3) and Adrian Molina. The first Pixar film to focus on Latino culture (the story takes place in Mexico during the Dia de Los Muertos (Day of the Dead). Coco is an example of a well crafted story, combined with an authentic vision that stays true to the Mexican spirit. 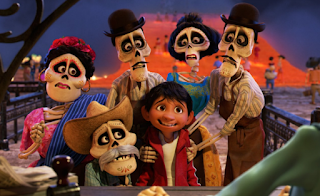 The story focuses on a young boy named Miguel who struggles with a shoe-making lineage of family despite his deep desire to be a mariachi-style musician. He ends up accidentally visiting the land of the dead, exploring his own family tree first-hand in an attempt to both further his desire to play music and connect with his heritage. Connections between the present and past are explored within this movie in a unique way through layered story-telling. There are elements of Beetlejuice here in terms of the living and dead co-existing, but most everything here is extremely original. The Latin-fueled music throughout is excellent and the lead child actor Anthony Gonzalez sings his songs with such passion and vigor it helps you believe that Miguel has that undeniable musical passion within him. I can't really give away a lot of the plot because there are some twists that are best left unspoiled to fully enjoy the narrative. Benjamin Bratt, Gael García Bernal and others including Edward James Olmos lend their voices to the amazing vibrant visuals of Mexican celebration and culture that are painted beautifully on the screen. Pixar's animating gurus did an amazing job of animating the skeletons from the land of the dead with realistic and creative bone movements throughout. I had so much fun watching this movie and the story really spoke to me personally. I often think about death and family and the unknown surrounding our mortal demise. This film explores all of that in way that kids can enjoy but parents can probably appreciate more. Coco is simply a celebration of music, culture and family that cannot be missed. You need to go see this movie right away. 5 JRs for Pixar's best accomplishment since Wall-E.
And.... on to another disappointment with a DC comic book film. Justice League is a film that plods along trying to energize the franchise with some banter between DC's all-star cast of superheroes. Honestly I don't care about this reincarnation of Superman. Man of Steel was not good and I haven't really bought into Henry Cavil since. Aquaman is a waste of time and while Jason Momoa is game, his character is basically a "bro" with super powers who says "My Man" one too many times. Unlike what Marvel has so deftly done with their cinematic universe, we get introduced to Flash, Aquaman and Cyborg all at the same time, so this is merely an exercise in taking the three main characters we saw from Batman v Superman (including Wonder Woman) and throwing a whole new set of characters into the mix. Marvel sets up most of it's characters in standalone films and brings them together with more backstory already laid down. I don't want to get in an argument about DC vs Marvel, because I'm definitely not a comic book nerd (never bought or read one). I was entertained at times with Justice League (with Ezra Miller's Flash in particular) but it's simply a universe I care far less about than Marvel. I was all-in on Batman when Nolan had control but once Zach Snyder and company took over (Nolan does have a producing credit here) I feel some of the creative quality has suffered. A frustratingly bland 2 out of 5 JRs for this film.